After Midnight: Thank you Zach & Irina! Thank you Zach & Irina! I just wanted to give a HUGE thank you to ZachsAnomaly and Irina also known as Severinka or Ms. Adrienne for creating various pieces for After Midnight upon request. They were both quick and so very kind and I am just beyond thrilled with the results of their labors! You can download them on his webpage at DeviantArt. You can download them on her blog here. Thank you once again to all of the modders and creators out there that continue to make objects, poses, clothing and lots that have made storytelling TONS easier! It would absolutely not be possible without your great minds and helpfulness! I love you all! Holy poop, those wolf skins/sliders/I don't even know are pretty awesome. 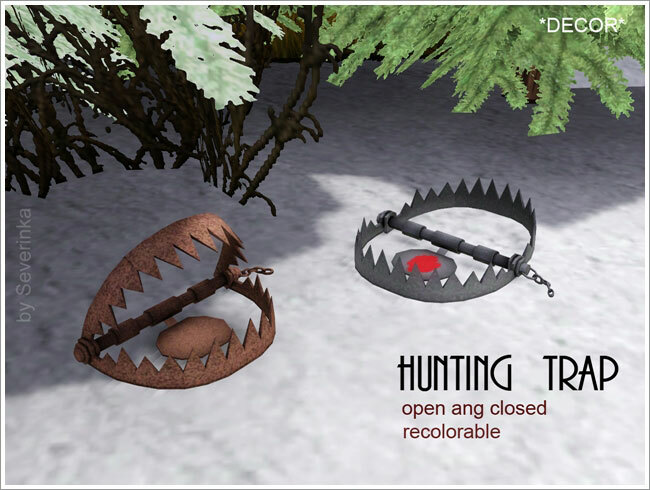 So are those hunting traps. Good job ZachsAnomaly, Irina, and Daij! You are all awesome. Yes! I was completely blown away when he finished it. And Irina, she accepted my request and had it done within days it was great! I know how busy she is making all of the amazing CC she does so I was honored she accepted my request! It's just awesome to have people like them in the community!